Mark Eden-Should The Police Be Monitoring This Man? The anarchists, Greens and other subversives have been going daft after it was revealed that leading Christchurch activist Rob Gilchrist was a paid police informer. Gilchrist had been spying on the Save Happy Valley Coalition, Peace Action Wellington, "animal rights" organisations and several other anarchist led groups for up to a decade. Should the police spy on protest groups? Are these people really just concerned individuals out to better society? Here is a profile of Mark Eden, a close friend (and probable target)of Rob Gilchrist. 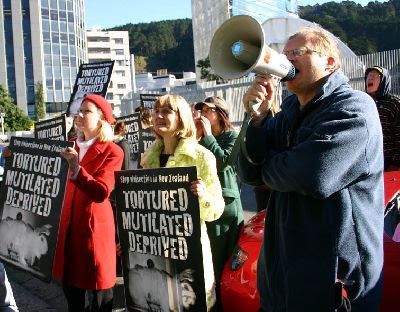 Eden and Gilchrist were seen together at protests all over New Zealand for years. Everywhere Eden was, Gilchrist was perched on his shoulder like an angry parrot. The duo were the "Uncle Ernies" of the New Zealand anarchism, adept at seducing young innocents into the movement, with their stories and their militant bravado. Mark Eden (aka Markypoo, Mr Grumpy, Mr G) has been one of New Zealand's leading anarchist/animal rights activists since at least the mid 1990s. In February 1996 Mark Eden (Age 27, woodcutter, Newtown) was one of six people arrested at Waitangi protests in Wellingtn. All pleaded not guilty . Later that year the unemployed Mark Eden was sentenced to 100 hours community service and reparations of $1911 after smashing windows with slingshots, gluing locks and painting "kill all duckshooters" on the Complete Anglers Shop in central Christchurch. Eden has been arrested at least a dozen times since those landmark events, but has been very seldom convicted. Also in 1996 Eden was a spokesman for the Canterburyy University Animal Rights group (part of Kaimanawa Horse Action Network), protesting against the proposed wild horse cull on the Central Plateau. In October 2001 Eden attended the Anarchist Odyssey conference in Christchurch. For me, the main contrast between this and previous anarchist conferences was that this conference had a lot more politics in it. Most of the conference goers were involved in activist groups and political movements. This was in contrast to conferences in the 90s that were often dominated by lifestyle topics and only a minority of people there were politically active. In October 2003 Eden was arrested with Maoist Jared Phillips and Trotskyist Paul Hopkinson after a flag burning incident during the visit of then Australian Prime Minister John Howard. In 2004 Eden was active in anti Iraq War demonstrations with the anarchist led Peace Action Wellington. In 2005 the Premier Bacon Company threatened legal action against Mark Eden of the Wellington Animal Rights Network, for registering premierbacon.co.nz and putting up a website criticising Premier Bacon’s factory farming practices. In 2006 Eden travelled to an animal "rights" conference in the UK where he met notorious Animal liberation front activist Keith Mann. Eden's group Operation Rescue (well known for stealing chickens from poultry farms) invited Mann to tour New Zealand the following year, but Mann was stopped at Heathrow Airport because of his serious criminal convictions. Mark Eden is part of the anarchist crowd that hangs out at 128 Abel Smith St in Wellington's Aro Valley. Many of those arrested in the October 2007 police anti terror raids also frequented that address. Eden's girlfriend Catherine Amey in particular was very close to at least one of those arrested. Amey's car was observed parked near one of the Urewera training camps. Mark Eden has recently been involved with Teanau Tuiono, an Urewera 17support activist, whose own home was raided during the police sweep. Please comment on the thread below whether or not you think a responsible police force should be monitoring individuals like Mark Eden and co.
lets ask Mr Gilchrist what he thinks of the people he was spying on . .
"I know they are good people trying to make a better world." now, why would he say that Trevor? Those videos were indeed disturbing. I think a responsible police force should be monitoring farmers who treat animals like that. On the other hand, I note that Mr Eden is opposed to hurting animals or humans. Oh hell yes, I think that giving hundreds of thousands of dollars every year to police to monitor someone who films himself breaking the law is a very good idea. I think that given my libertarian beliefs I think the state should be putting their resources into the Mr Eden. I mean its not like the police could use his own footage and his admitting to when and where and what he did to prosecute him (as they did)instead we need covert police officers and counter terrorist units. I think its very good that the police didnt have to get warrants to attend meetings, get on email lists, hold conversations etc. Bestest of all I think its great that the state is paying someone to get into fights with cops, encourage people to commit burglary and bomb threats etc as Rob did on many occasions. Eden is obviously just one step away from heading up the Kyber Pass, Afghanistan, to train for his inevitable Jihad. He needs to be locked up in Guantanamo for this precrime before another 9/11happening here. So rapido rapido, someone report him quickly to the precrimes unit called the Special Intelligencia Group! Mark Eden was very close to Rob Gilchrist the police informer. Maybe Mark Eden is also a police informer. Not only should the police be monitoring Mark Eden but so should the radical subversive groups that he claims to support. It is usually the person you least expect who is the double agent and they go out of their way to appear to be a true believer. I have firsthand experience of the fact that there is an interlinking of membership, techniques and broad objectives between a huge range of activist groups in New Zealand. If a person is, for example, an anti-GE activist, then they will almost inevitably at some time exchange intelligence, techniques and ideas with other groups like the Zapatistas, 'peace' groups or animal 'rights' organisations - most of which view our society as the enemy which must be attacked and overthrown. This is how these people operate. Being an 'activist' doesn't necessarily mean that you are exclusively committed to any particular cause per se. What it means is that you are angry and pissed off at the society you live in and want to change it to reflect your views about how it should be. The activist cell that you operate in is simply the means by which you feed your own sense of righteousness and get your metaphoric (and sometimes actual) rocks off. If you read Scoop, Indymedia and any number of other radical sites, it should be glaringly apparent that tomorrow's bombers, saboteurs and Tuhoe guerillas start off as today's Greenpeace leaflet distributors outside your local New World. I am shocked that Howard Broad's bumbling politically correct plodders were entrusted with the task of checking up on these people instead of the SIS, under whose pervue this scene more properly belongs. Dave-have you been involved in activism yourself? Dave you are talking through a hole in your head. Do you have any actual evidence for any of the ridiculous assertions you are making (you know like surveys, demographic data, longtitudinal studies and the like) or are you just making things up as you go along. As an ex-activist myself many years ago I have seen how there is a cross-fertilisation of dienchantment between a huge range of groups. Obviously I am not saying that 'all activists are bombers'. That would be stupid.... but the likes of Greenpeace, Animal Rights, so-called Social Justice groups etc are the breeding and training grounds for tomorrow's criminal damage and social disruption brigade. Read my words. I'm not saying they ALL are potentially violent criminals.... I am saying that that's where they come from (the activist criminals, that is, obviously not gang members and the baby killers). I know from inside information that Mark Eden is liberating animals in order to form an Animal Satanic Soviet Jihad Force that he will use to take over the world! A perfect illustration of my point about the cross-feretilisation of activism across different groups can be found on page A7 of today's SST, where one Simon Oosterman is pictured at an anti-Youth Rates protest and is also reported as having been pepper sprayed by police in 2005 during an anti-GE protest at the Forest research Institute in Rotorua. So that's at least two 'worthy causes' that this Oosterman scum is wasting his useless life on. How many others are there? And how many other parasites like this man are spending their bottomfeeding lives stirring up trouble on a variety of 'causes' just for the buzz of being 'anti' something? Hey Dave. You're a fuckwit. There you go... above is a person who is frustrated by his (and no, I'm not PC so you can read whatever gender you like into the word 'his') lack of ability to present a cogent argument.. so he simply resorts to impotent name calling! Go for it. merry Christmas to you. Looks like Eden has had a bloody good career. Terrifying. Eden steals chickens from battery farms. Who knows where those chickens end up? Quite likely as a kebab sandwiched between pita bread on some mad muslim bomber's dinner plate. Obviously the anti-terrorism special forces need to watch him carefully before he goes to the next level and starts stealing turkeys. Then no police informant will be safe in their beds at night for fear that a bespectacled face might appear at the window asking "Is this the battery farm or do I have the wrong address?" Watch out for those video cameras Sam.